↑ ୧.୦୦ ୧.୦୧ ୧.୦୨ ୧.୦୩ ୧.୦୪ ୧.୦୫ ୧.୦୬ ୧.୦୭ ୧.୦୮ ୧.୦୯ ୧.୧୦ ୧.୧୧ Hubbard, MJ; Hildebrand, BA; Battafarano, MM; Battafarano, DF (June 2018). "Common Soft Tissue Musculoskeletal Pain Disorders". Primary care. 45 (2): 289–303. doi:10.1016/j.pop.2018.02.006. PMID 29759125. ↑ ୨.୦ ୨.୧ ୨.୨ ୨.୩ ୨.୪ ୨.୫ ୨.୬ ୨.୭ ୨.୮ ୨.୯ "Tennis Elbow (Lateral Epicondylitis)". OrthoInfo. July 2015. Retrieved 21 June 2018. ↑ ୩.୦ ୩.୧ ୩.୨ ୩.୩ ୩.୪ ୩.୫ ୩.୬ Vaquero-Picado, A; Barco, R; Antuña, SA (November 2016). "Lateral epicondylitis of the elbow". EFORT open reviews. 1 (11): 391–397. doi:10.1302/2058-5241.1.000049. PMID 28461918. ↑ Lian, Jayson; Mohamadi, Amin; Chan, Jimmy J.; Hanna, Phillip; Hemmati, David; Lechtig, Aron; Nazarian, Ara (2018-10-31). "Comparative Efficacy and Safety of Nonsurgical Treatment Options for Enthesopathy of the Extensor Carpi Radialis Brevis: A Systematic Review and Meta-analysis of Randomized Placebo-Controlled Trials". The American Journal of Sports Medicine: 363546518801914. doi:10.1177/0363546518801914. ISSN 1552-3365. PMID 30380334. ↑ Wolf, Jennifer Moriatis (2015). Tennis Elbow: Clinical Management (in ଇଂରାଜୀ). Springer. p. 1. ISBN 9781489975348. Wilson JJ, Best TM (September 2005). 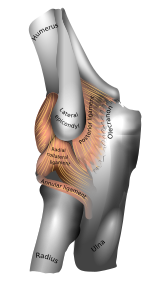 "Common overuse tendon problems: A review and recommendations for treatment". American Family Physician. 72 (5): 811–8. PMID 16156339.